DESERT rebels have seized a number of towns in Azawad as the Western forces dislodge Islamic groups. 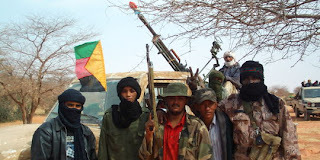 The original 2012 liberation of the Sahara territories by the Mouvement National de Liberation de l'Azawad was disrupted by the involvement of 'al-Qaeda' forces in the area. In a press statement released on January 28, the MNLA said the towns of Kidal, Tessalit, Léré, In Khalil, Anefis, Tinzawatène, Tessit and Talatayt were now under its control. It said the local population was in danger from the return into Azawad of Malian troops, following in the footsteps of French forces. The MNLA said the Malian army had a history of carrying out massacres of unarmed people in Azawad and since the French intervention more than 100 people had already been targeted in reprisals against Touaregs, Peuhls, Sonrai and Arabs. It said it was assuming the responsibility of securing its towns and protecting its people against an army which specialised in crimes against the civilian population of Azawad. Azawad formally declared its independence in April 2012. A statement from the MNLA referred to the "complete liberation of the territory of Azawad" achieved in the remarkable final uprising which began in January of that year. 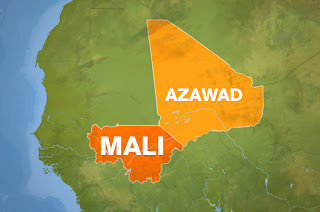 It recalled that in 1960 Azawad was attached to the state of Mali, created by France - the former colonial power - without the consent of its people. And it mentioned the massacres, extortion, humiliation, despoilment and genocide carried out against Azawad in 1963, 1990, 2006, 2010 and 2012. It condemned the "inhuman behaviour" of Mali in using various droughts (1967, 1973, 1984, 2010….) to try and wipe out the people of Azaward at the same time as it had asked for and received generous humanitarian aid from overseas. Azawad consists of the regions of Timbuktu, Kidal, Gao, as well as a part of Mopti region and borders Mali and Burkina Faso to the south, Mauritania to the west and northwest, Algeria to the north, and Niger to the east and southeast. It straddles a portion of the Sahara and the Sahelian zone. Azawad is said to be an Arabic corruption of the Berber word "Azawagh", a dry river basin that covers western Niger, northeastern Mali, and southern Algeria. The name translates to "land of transhumance". AN EGYPTIAN anarchist movement has emerged on the streets with a wave of firebombings and street fights. The new wave of revolt is also sweeping through other Arab countries, with anarchist groups in Tunisia, Morocco, Syria and elsewhere. Anarchists have been present in Egypt before, during, and after the revolution, but until today, they have yet to organize a mass grouping under the banner of anarchism, explains blogger Ryan Harvey. The Ultras of Egypt’s football clubs have for years been associated with anarchist ideas and actions, and they are widely credited with having initiated the level militancy that brought down the Mubarak government in February of 2011. This week anarchism left the graffitied walls, small conversations, and online forums of Egypt, and came to life in Cairo, declaring itself a new force in the ongoing social revolution sparked two years ago with multiple firebombings against Muslim Brotherhood offices. Later, the government shut down the “Black Blocairo” and “Egyptian Black Bloc” Facebook pages, but they were soon re-launched. “Wait for our next attacks as we respond to the closing of our official page…” they posted in a statement posted online (translated below). On Thursday the black bloc made its first mass-appearance in Tahrir Square, and, shortly after, firebombed the Shura Council (Egyptian Parliament), tore down a section of the protest-barrier walls leading from Tahrir Square, and, with others, engaged in fighting against security forces. FASCISM or revolution is the clear choice now facing the people of Greece, as the neoliberal regime stamps down even harder on people's basic rights. On Friday January 25 riot police stormed the Athens metro's main depot and attacked striking workers staging a blockade. Reports The Guardian: "State-run television showed police handing strikers civil mobilisation papers. The workers, who had defied court decisions labelling the action 'illegal and abusive', face immediate arrest and loss of jobs if they refuse to return to work in the next 24 hours." Kathimerini adds that the head of the metro workers’ union, Antonis Stamatopoulos, has accused the government of being a “junta” and said that the protesting workers at the metro’s main depot in Sepolia would not be brought out of there alive. "All the other public transport unions came out in support of the metro workers by announcing 24-hour strikes for Friday. 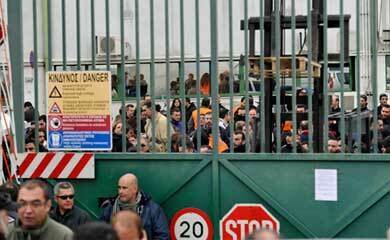 Greece’s main private sector union, GSEE, also backed the action. Two senior SYRIZA MPs, Panayiotis Lafazanis and Dimitris Stratoulis, visited the Sepolia depot to express support for the strikers and their opposition to the government’s decision." The plutofascist system is prepared to use brute force to push the population of Greece into slave-labour conditions - and if they succeed there they will extend their new 21st century authoritarian version of capitalism to the rest of Europe and beyond. Our only hope for the future is to defy them all the way and to risk everything for the freedom of tomorrow's children. ENDLESS war and plutofascist imperialism will be the hallmark of the UK's presidency of the G8, says prime minister David Cameron. Ten years after the US-led invasion of Iraq, neoliberal powers are launching a new phase of their phoney "War on Terror", now on the south side of the Mediterranean. The Daily Telegraph reports that speaking at Chequers, Mr Cameron claimed there was a growing "terrorist threat" in North Africa and talked up the need for a "prolonged struggle" to counter it. He said: “It will require a response that is about years, even decades, rather than months, and it requires a response that is patient, that is painstaking, that is tough but also intelligent, but above all has an absolutely iron resolve; and that is what we will deliver over these coming years. The Western powers are using the usual bogeyman of "al Qaeda" as the excuse for a military assault on the territory of Azawad, which declared its independence from Mali last year. But, beyond the shrill warmongering of the corporate media, informed voices are exposing the other agendas that, inevitably, lie behind the military involvement. Stéphane Lhomme, director of l'Observatoire du nucléaire, points out that the real reason for the French intervention is to secure the supply of uranium to the country's powerful nuclear industry - the mineral is sourced from mines in the north of Niger, a desert area separated from Mali only by a hypothetical line on the map. And in a letter published in the Evening Standard on January 17, Dr. Nafeez Mosaddeq Ahmed responded to Nabila Ramdani's endorsement of France's Mali intervention, supposedly "aimed at ridding Mali of particularly sinister insurgents," saying it overlooks key factors which have now made themselves manifest in the hostage seizures in Algeria. "Firstly, 'al-Qaeda in the Islamic Maghreb' (AQIM) was, according to experts like Professor Jeremy Keenan from SOAS - the most cited academic in the world on North Africa - virtually manufactured in the region by Algerian intelligence services with clandestine US support. "This short-sighted policy originated with the Algerian military junta's attempts to fabricate a justification for exterminating members of the peaceful Islamic Salvation Front after it won democratic elections decades ago. The policy was reinforced by NATO's intervention in Libya, shoring up Islamist militias with AQIM affiliations across the region. "Mali is believed to have significant oil and gas potential. "A confidential US embassy cable (8 May 2006) obtained by Wikileaks observes that a "significant impediment" to "extracting and transporting oil" in Mali is "regional political instability and terrorist activities." "With reports of extensive civilian casualties due to French airstrikes, it is far from clear that they will be beneficial for Mali, even if Ramdani concedes they may be troublesome for France. Such military action will only lend legitimacy to the most virulent AQIM components of the insurgency. "A better approach would be to cut off AQIM at source - by reigning in Algerian military intelligence. But perhaps that's not the point." Cameron's declaration of the G8's key role in the neoliberals' war on North African war will intensify protests against the June summit currently being planned in the UK by Stop G8. RESISTANCE against the plutofascist state in Greece continues in the face of continuous attacks by the authorities. An attempt to crush Greece’s oldest anarchist squat, Lelas Karagianni 37, was defeated on Tuesday January 15 when it was reoccupied later the same day. 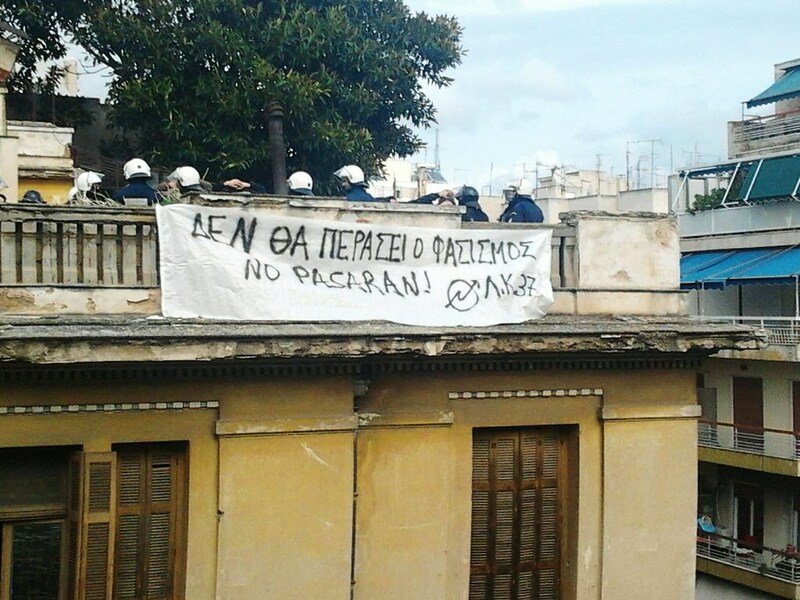 At about 12.00pm, cops raided the famous squat, reports Contra Info. Supporters and neighbours gathered at Amerikis square and then outside the squat, trying to prevent the eviction. There were several comrades chanting slogans on the rooftop of the building that were caught by the police. Also, two supporters were beaten by cops on the street and detained as well. Heavy repressive forces were deployed downtown, plus a police helicopter. Soon thereafter, more people were assembled near the squat. A gathering was called for 15.00 outside the police headquarters on Alexandras Avenue, in solidarity with the 14 squatters who were arrested from inside Lelas Karagianni, and a discussion was announced for 19.00 in the Athens Polytechnic (entrance from Stournari street). Reports Contra Info: "All of the arrested comrades were released at about 17.00 and Lelas Kariagianni squat was reoccupied!" 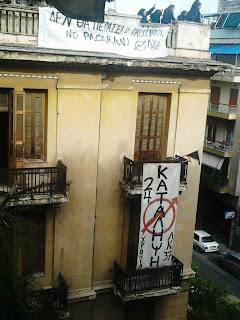 Last weekend saw a big Athens protest in solidarity with squatters, as this video shows.